Finike (ancient name is Phoenicus) is a district on the Mediterranean coast of Antalya Province of Turkey, 90 minutes west of the city of Antalya. Finike is located in the south of the Teke peninsula, and the coast here is a popular tourist destination. 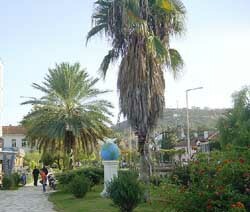 However, Finike is best-known for its oranges, the symbol of the town. For centuries Finike, then named Phoenicus was a trading port, the main port of Limyra, the capital city of Lycia. Phoenicus was said to have been founded by Phoenicians in the 5th Century BC, and thus named after its founders. The area has been inhabited for much longer than that, archaeologists have found evidence near the town of Elmalı showing that the Teke peninsula has been settled since 3000 BC (although on the coast nothing has been uncovered dating before 2000 BC). Trade along the coast was established first by the Persians, who relinquished Lycia to the armies of Alexander the Great. However the coast was always vulnerable to forces from Syria, Egypt and Rhodes until it was brought within the empire of the Ancient Romans and the succeeding Byzantines. Even then the Byzantines were threatened by the Arab armies of Islam. Eventually the area was lost to the Seljuk Turks in the 13th century. These were succeeded by the Ottoman Empire from 1426 AD. The port of Finike is now a yacht marina, and has a small fishing fleet. The coast is rich in marine life including sea turtles and fish including local specialities red porgy Sparidae and grouper (Epinephelus); other fish found along the coast include leerfish Carangidae) and the more widespread Mediterranean varieties such as bluefish, sea bream, sea bass, with swordfish, sardines and others found further out to sea. However the coast suffers from overfishing and many varieties, including the porgy, are in decline. The beaches of Finike are an important nesting ground for the caretta caretta sea turtles, and the rocky parts of the coast are used by the rare Mediterranean Monk Seal.